Rwanda Athletics Federation (RAF) has announced the official dates for this year’s 13th edition of the annual Kigali International Peace Marathon. The event will take place on Sunday May 21, 2017 starting from Amahoro Stadium. RAF said that MTN will once again be the official sponsor of the Marathon. The annual event is organized to commemorate the 1994 Genocide against the Tutsi through peace and reconciliation. The event that is run in accordance with the rules and regulations of the International Association of Athletics Federations (IAAF), as well as the International Marathon and Distance Races (AIMS). Registration is already underway via MTN Mobile Money although participants can also register directly at Amahoro Stadium and online at www.kigalimarathon.org for international participants. The fee this year will be Rwf2,000 for Rwandans and Rwf20,000 for non-Rwandans. 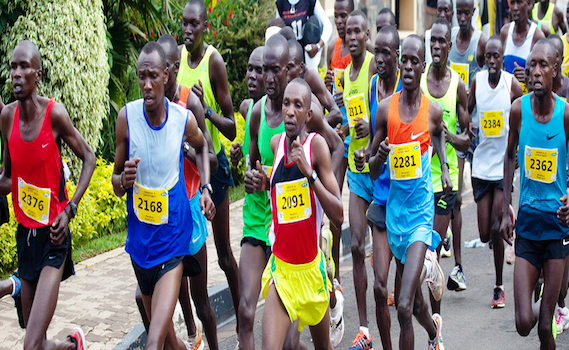 The event will include of a Family Run of 5km, the Half Marathon of 21km and the Full Marathon of 42km, with all categories starting and ending at Amahoro Stadium in Remera. Last year, Kenyans dominated the race with James Cheritich Tallam winning the men’s (42km), Jeruiyot Chemweno won the women’s race after clocking a time of 2hours 38 minutes and 20 seconds. Benson Kipruto won the mens half marathon (21km) after clocking one hour four minutes and thirteen seconds and still kenya female long distance runner Anges Jeruto clinched Gold in the women’s half marathon.